Over the last few years Palm Cove has turned into an elegant and sophisticated holiday destination for many Australian and International visitors. Perfectly located on one and a half kilometers of pristine beachfront over looking the Coral Sea, Palm Cove resorts have many advantages over other beach resorts. Because of Palm Cove’s position between the ocean and a mountain range, there is very little land left for development – the result being a quaint resort community, full of personality without the crowds. Palm Cove accommodation - book the holiday of a lifetime now. The Cove is one Australia’s leading tropical destinations. There is a wide range of resorts and resort style apartments, perfect for boutique and luxury holidays. Palm Coves Resorts are generally properties with lots of facilities. Like a golf course, tennis courts, day spa, children’s club, restaurants, room service, gift shop and tour desk. Sea Temple Resort & Spa Palm Cove, Novotel Rockford Palm Cove Resort and Alamanda Palm Cove by Lancemore & Spa are excellent resorts we can recommend in this category. Holiday travellers staying at a Palm Cove resort have a great base to explore the surrounding areas. You are at the door step to the Great Barrier Reef and a massive range of reef trips, including snorkeling and scuba diving, are at your disposal. On land, Palm Cove sits just below the Daintree Rainforest and there a number of rainforest tours (including 4 wheel driving and treks) that are available. Just a short 20 minutes drive from Cairns International Airport, Palm Cove sits on a beach once voted the cleanest in Australia. Stepping out of a Palm Cove resort and the dining and day activity options are endless. There are several world class restaurants at Palm Cove and many offer dinner while over looking the ocean at sunset. During the day you can keep busy by trying the world famous Skyrail and Kuranda Scenic Railway. There are several Zoos and Wildlife parks nearby also. Palm Cove resorts are the perfect place for weddings and honeymoons. It is becoming more and more popular to have your vows done on the beach with the sounds of the sea and perfect weather adding to the atmosphere. The Cove is a quiet place, so interruptions aren’t an issue. Many of the resorts have reception venues and are scattered all along the beach. Honeymoon couples love using a day spa and Palm Cove is full of resorts offering health spas. Offering the latest in health and eco massages and wraps, these day spas are very popular and quite busy so reservations are necessary. 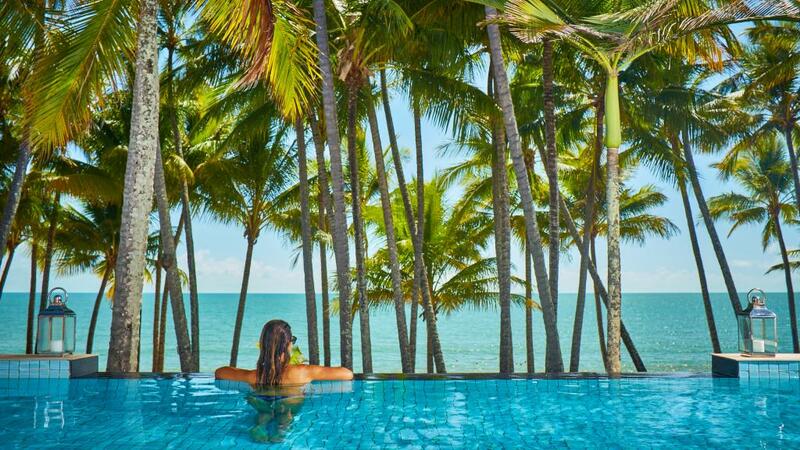 Palm Cover resorts offering the best in health spa facilities are Sea Temple Resort & Spa Palm Cove, Alamanda Palm Cove by Lancemore & Spa, Peppers Beach Club & Spa and Sebel Reef House & Spa.